Narine of Noe should have had her whole life to train to take her father’s place as High Sage. But when a mysterious force falls from the skies, sending the world into elemental chaos and her father into mortal danger, the fate of every living creature lands on her shoulders . . . including that of the Eternal Dragon. Without the Dragon it is impossible to regain the Balance of All Things. An elaborate plan to save the world must be hatched, and Narine is forced to take charge in a world gone mad. Before the White Forest was born, before the Great World Cry, the story that started it all. . . 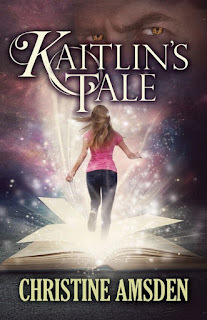 There's a facebook party going on today to celebrate the release of Kaitlyn's Tale by Christine Amsden. Why not join in and find out more about a scarily grown-up paranormal world, just slightly set aside from our own, with stories perfectly designed for all the mothers of Harry Potter fans. Today I get to sneak in on a round table chat with Karin Thomas. says Annamaria, who's providing the table. Appearing on the Round Table Chat is Karina Thomas, introducing her latest romance One Last Chapter. To indulge in this latest news, grab your favorite drink and join Annamaria Bazzi on the Round Table Chat. All roads lead to Rome, or so I'm told. But perhaps they lead to different Romes, to imagined destinations where all is revealed. The thought had me wondering if all novels somehow incorporate roads, or paths at least. Though the first one I read last week has a whole long list of very real roads, criss-crossing the States and leading, inevitably, home. Asphalt Asylum by Steve Theme chronicles a hitchhiking trip from Washington to Florida and back, and is probably memoir rather than novel - which means it really shouldn't be my sort of thing, but I loved it. The author lyrically recreates the scenery for the readers, then invites us into the lives of some fascinating drivers, ranging from generous to scary. It's the kindness of strangers (and sometimes, maybe, their prayers) that protects him, and the loser wins and finds himself. A very cool narrative, best enjoyed with some well-balanced, full-flavored three-star coffee. Start at the beginning, work through the middle, and finish up at the end - that's the way to do it, isn't it? Whatever "it" may be. But do stories really have to start at the beginning? I've heard a lot of writing coaches suggest we start with the middle - find out where the story's going then we'll know where it began; but of course, for the reader the story still starts at that newly and beautifully rediscovered beginning. There are others who insist the published tale should start in the middle of the action, revealing the past when things calm down, then heading for the future - got to grab those readers, right from the start you see. Then there are books that start at the end, or nearly the end, jumping to "six months earlier" or three hours or three days. TV shows do it to. They drive my sons crazy. Georgia L. Jones' Remnants of Life Series Virtual Tour! Today I'm delighted to welcome Georgia L. Jones to my blog. She's the author of the intriguing Remnants of Life series, and she's touring the internet with books one and two, Legends of Darkness, and Witches. Pull up a chair, fill your mug with rich dark coffee, and then read what she has to say about how this series "began to creep into [her] mind." I’m currently working on the final book in the trilogy of Remnants of Life as well as several other projects. The first book in the series, Legends of Darkness, launched on March 17, 2012; the second, Witches, launched on December 1, 2012. Today I'm delighted to welcome author Bob Freeman to my blog to answer just a few questions about his Cairnwood Manor Series of books. I really enjoyed the first book, Shadows over Somerset (click to read my review), so I'm delighted to find there's another, and even more delighted to get to ask the author some questions. So, find yourself a good strong cup of coffee, sit down and enjoy. Hi Bob, and welcome to my blog. Since I grew up in Britain and enjoyed many vacations in Scotland, I have to ask you, Indiana and Scotland? What do they have in common? Well, for starters, both are near and dear to my heart. I am a Hoosier, born and bred, but I've felt a kinship to Scotland since I was a child. Strike out away from urban centers, into the rural countryside of both, and I believe you'll find Scots and Hoosiers kindred spirits, hardworking, salt of the earth folk who are connected to the land beneath their feet.